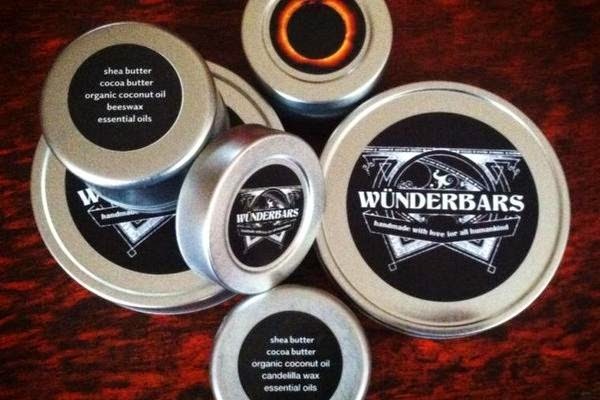 wolfie and the sneak: Wunderful giveaway! * * It's GIVEAWAY time! * * I think Wunderbars are so great I bought 20 sample sized bars for you guys! I've put together a little gardening-based gift for 10 of you: 2 bars (1 lavender, 1 lemon), 2 blank cards (Heirloom Tomato ID, and Basil ID) from moi, a smattering of seeds, and a little batch of worm poo from our vermi-bin. How do you get one? Comment below about how you could use a little bit of lotiony luxury in your life, and tell me which fragrance sounds best to you! Easy peasy! Enter once, make sure you leave an email address so I can get your mailing address, and I'll draw 10 names once the giveaway closes, tonight (Wednesday, 5/7) at midnight. We had a table at Craft Cville (Tom Tom Founders Fest) a couple weeks back and were luckily placed next to the lovely Christin and her daughter Lux. 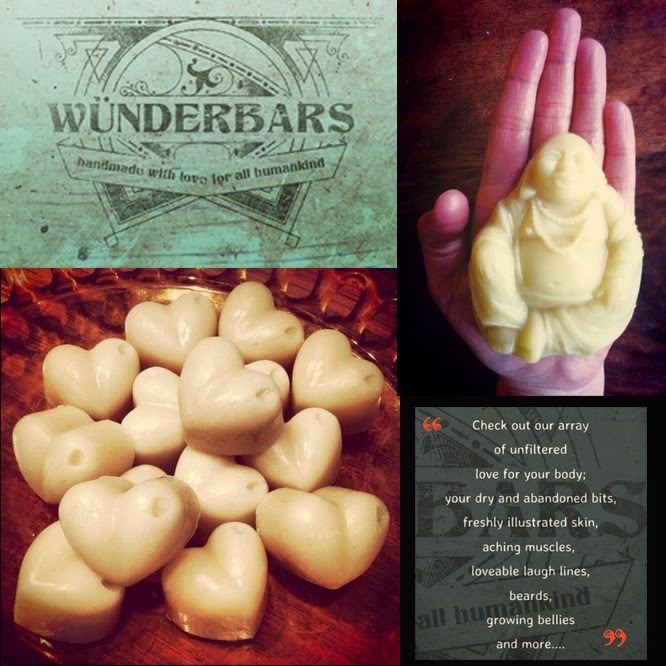 Christin owns Wunderbars, a line of handmade solid balm massage and body lotion bars. I have a sample-sized bar and love it! The fragrance isn't overpowering, and the natural moisturizers don't leave a greasy or heavy feeling...just beautifully soft skin! I've been using mine post-gardening. All that hand washing dries out my hands and the bar adds the moisture back after a full day of digging without gloves. Christin and I have kept in touch since the show (Mabel still asks when we can go back to Charlottesville so she can play with Lux again!) and she emailed me to tell me about her new Indiegogo campaign to get her business up and running. (Should I say skating?) 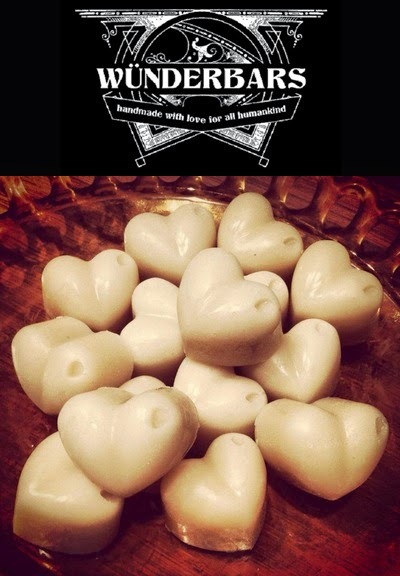 Not only does she want to be able to hire single parents to help her produce her amazing bars, but she sponsors skaters through a division of Wunderbars called Umbilical Skate! 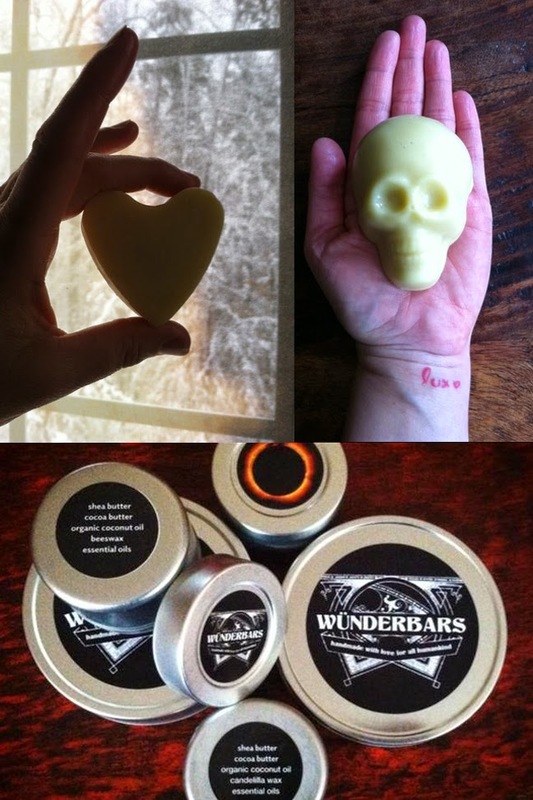 I think Wunderbars are so great I bought 20 sample sized bars for you guys, my readers! I've put together a little gardening-based gift for 10 of you: 2 bars (1 lavender, 1 lemon), 2 blank cards (Heirloom Tomato ID, and Basil ID) from moi, a smattering of seeds, and a little batch of worm poo from our vermi-bin. How do you get one? Comment below about how you could use a little bit of lotiony luxury in your life, and tell me which fragrance sounds best to you! Easy peasy! Enter once, make sure you leave an email address so I can get your mailing address, and I'll draw 10 names once the giveaway closes, tonight (Wednesday, 5/7) at midnight. I have itchy skin this pregnancy, so more natural products is exactly what I'm looking for! I'm interested! I love trying new products! Between the last vestiges of winter skin and the beginning of garden season, I could really use this product! Not to mention I love anything lavender! Love your bruschetta cards, so please count me in! And lemon-scented lotion sounds heavenly. Lavender, of course. Recent lay off in our household so stress...pfffff... yeah, I have a little. Love your art! This is such a generous, thoughtful idea, Renee. I love lemon the most. Lavender tends to make my nose stuff up although I still grow it in my garden. :) For some reason, I don't react to the fresh flowers only dried. how can you choose between lemon and lavender? i guess i would choose lemon but only if you held a spork to my throat. I had a twitter comment, so that makes 9, one last goodie pack to give away!